SI.com has reported that former Penn State University president Graham Spanier has been indicted by a grand jury in Pennsylvania for his role in the Jerry Sandusky child abuse scandal. Spanier has been charged with lying to the grand jury that initially investigated the matter beginning in late 2010 and with seeking to cover up documentary evidence of allegations made against Sandusky. Spanier is specifically charged with perjury, obstruction of justice, endangering the welfare of children, failure to properly report suspected abuse and conspiracy. Additional charges on child endangerment and conspiracy were also brought against former Athletic Director Tim Curley and former Vice President Gary Schultz. Both of these men had previously been charged in early 2011. 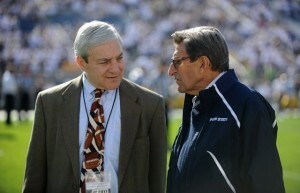 Spanier is required to appear in court soon, perhaps as early as November 2. He will undoubtedly enter a not guilty plea to all charges as both Curley and Schultz have previously done. All three men are expected to have their cases come up for trial at some point in 2013. The grand jury that indicted Spanier apparently took testimony from his former administrative assistant and also reportedly had access to a copy of a paper file Spanier had made and given to his administrative assistant with instructions to not talk about it and to not show the file to anyone. Penn State’s football team has enjoyed a surprisingly successfully season so far with a record of 6-3. All home games have been sellouts. Bad news, however, has a way of surviving forever. This most recent report comes a day or so after the Pennsylvania Department of Corrections announced that Sandusky has been transferred to a maximum security prison in the southwestern part of the state where he will serve out his sentence. The prison houses most of Pennsylvania’s death row inmates, and Sandusky will be house in an individual cell in what amounts to solitary confinement. He will be allowed out of his cell five times per week for an hour of exercise and will be allowed out three times per week to take a shower. Any counseling and other activities he becomes involved in will take place in his cell. Penn State supporters, no doubt, would just like to see all of this resolved and done with. This speaks to a trait in our society. We commiserate with the victims of abuse and their families and vilify the perpetrators. In the end, however, we want to see the matter concluded so that we can get back to our normal lives. In this case, that means rooting for the Penn State football team and moving on from unpleasant thoughts. It may be that we have placed sporting events on such a pedestal that we lose perspective on the real issues of life. The National Basketball Association (NBA) agreed to a request from New York City mayor Michael Bloomberg and postponed the Brooklyn Nets season opener against the New York Knicks. Why did the NBA not just cancel its entire schedule for a week? Why are National Football League games going on in the Northeast this weekend when many people will still be without power and millions of lives will still be on hold dealing with the catastrophe? More people than we care to acknowledge are tired of the scandal at Penn State. Sports may reflect societal values; but ultimately sport is just a small part of life. We all might be better off if we could remember this essential fact.